Brownsville City Hall is located at 255 North Main Street, Brownsville, OR 97327; phone: 541-466-5666. Photo: John and Amelia Brown Farmhouse, ca. 1876, Route 228, Brownsville, OR. Listed on the National Register of Historic Places in 1978. Photographed by User:46percent (own work), 2009, [cc0-by-1.0 (creativecommons.org/publicdomain/zero/1.0/deed.en], via Wikimedia Commons, accessed October, 2014. 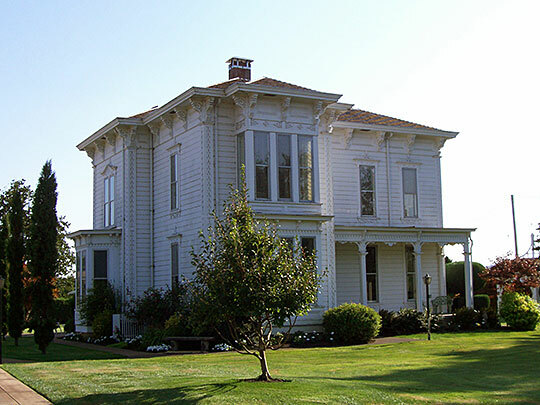 Brownsville, one of the earliest settlements in the upper Willamette Valley, was settled as early as 1846. The town was laid out by Hugh Brown and his nephew, James Blakely, in 1853. The small agricultural community prospered upon the development of woolen manufacturing on the Calapooia River, tributary to the Willamette, beginning in 1863. Brownsville was distinguished by the quality of its small scale buildings in the Classic Revival style. George C. Cooley came to Oregon in 1853 and found work in Brown and Blakely's general merchandise store, which was the first business in Brownsville, having beer established by the town's two founders. In 1857 he married Harriet, James Blakely's daughter, and over a period of a few years purchased the business which he ran as G. C. Cooley and Company until illness forced his retirement in 1905. Cooley also was associated with the Brownsville Woolen Mill. He was one of the first stockholders of the manufacturing company organized in 1861. Over a period of years, George Cooley purchased various lots in South Brownsville. While the date and terms of acquisition of the property on Blakely Avenue are not fully known as yet, Cooley's day book, which he carefully noted had been purchased in Portland on May 18, 1857, holds the key to how the property was developed. Cheryl Haworth and Joni Nelson, Architectural Restoration Society, Cooley, George C., House, Brownsville, Linn County, OR, nomination document, 1982, National Park Service, National Register of Historic Places, Washington, D.C.
**Information is curated from a variety of sources and, while deemed reliable, is not guaranteed.